The work at Carmarthen Castle, accompanies a long-term consolidation, enhancement and interpretation programme initiated by Carmarthenshire County Council. By the end of 2001, this had already resulted in the consolidation and re-opening of the Square Tower and Southwest Tower, overlooking the River Tywi, and the removal of surrounding buildings behind which they were hidden. The present phase includes the consolidation of the gatehouse, the selective removal of surrounding buildings, and the provision of public access, under the overall management of the Wrexham-based firm TACP. It is accompanied by a full programme of archaeological recording. The gatehouse is a complex structure. It was constructed in the early 15th century replacing, and perhaps incorporating parts of, an earlier structure that had been destroyed during the Glyndwr rebellion of 1405-6. The 15th century building appears to have been a twin-tower gatehouse, with chambers to the rear, over which lay domestic accommodation. This rear section has gone. 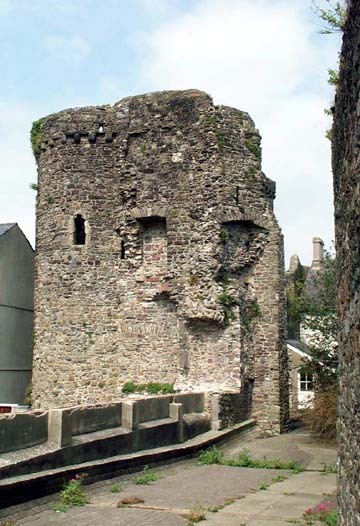 Structural evidence suggests that a block of garderobes and other service rooms occupied a turret in the angle between the gatehouse and the adjoining curtain wall. A limited evaluation suggests that the gate-passage contained a drawbridge-pit. The gatehouse suffered alteration, and partial demolition, during the post-medieval period. The ground floors of both towers were filled with mortared rubble, possibly during the Civil War as a measure against artillery. This rubble has been partially removed, as a result of cellar extensions from the neighbouring property to the south, and possibly as a deliberate measure in the north tower, associated with the construction of the county gaol on the castle site in the 1790s. The truncated remains of part of the rear section may survive in the perimeter wall of the gaol.